In 1947 the conservative Bradford car and van manufacturer launched their Javelin, a medium sized saloon with an extraordinary degree of technical innovation. 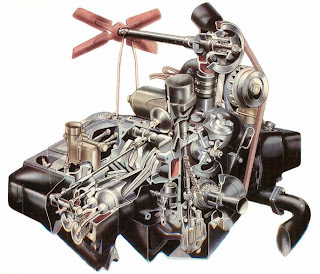 The car featured an 1.5 litre alloy-blocked overhead-valve flat-four engine with hydraulic tappets, streamlined bodywork inspired by contemporary American designs, and all round torsion bar suspension. All of this was possibly just too much for a small regional company whose core engine, a primitive flat twin last used in their Bradford van had the later distinction of remaining in continuous production, little changed, for 47 years. The corporate dyspepsia was evident soon after the Javelin's launch with MD and Javelin champion Charles Reilly leaving in 1948, and Gerald Palmer took a post in the Nuffield Group's design office the following year. Gerald Palmer’s contributions to the Nuffield group from 1949-1955, the Riley Pathfinder/Wolseley 6/90 and MG Magnette /Wolseley 6/90 suggests that he was denied the creative freedom of his Jowett years. Early engine and gearbox problems, and the resulting consumer distrust led to the Javelin never achieving its sales targets. The car underwent a number of engineering revisions and its integrity was demonstrated by a number of motor sport successes, including an outright win in the 1953 International Tulip Rally. 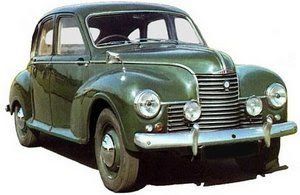 Perhaps the Jowett can now be seen as Yorkshire's equivalent of the NSU Ro80, another car form a small regional car maufacturer who had world-beating ambitions, withoout the depth of resources to see them through. Javelin production ended in 1953 with just over 23,000 produced. Jowett ceased to exist as a vehicle manufacturer in 1955, their owners selling the factory to International Harvester, and continuing in business as a supplier to the aircraft industry. Far from launching Jowett into the big time, the Javelin’s mechanical complexity and manufacturing cost were seen as its downfall. The decision to abandon car manufacturing, preserve jobs, and provide parts support for past products seems as courageous as the one Jowett made to put the Javelin into production. Better far to exit solvent, and with a continuing committment to past customers, than to die by badge-engineering.